top In light of all of the troubles and hardships in this world, thank you so much for remembering us and helping to keep our mission on the air. It�s truly cold now, and we�re down to six hours of sunlight each day. Firmly into another winter, we pause with prayers of thanksgiving for your prayers and your financial help. GETTING THE POINT: (left) Fr. 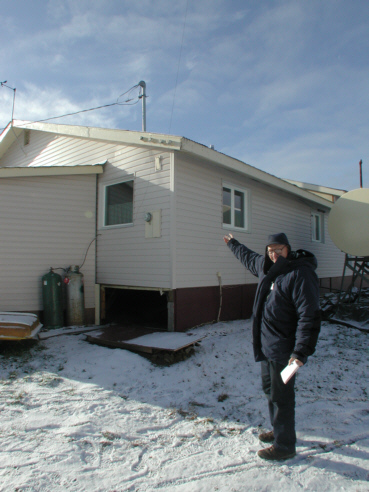 Joseph Hemmer, OFM motions to where we hope a KNOM translator antenna will be mounted on the back of St. Theresa Church�s rectory in the village of Kaltag. Fr. 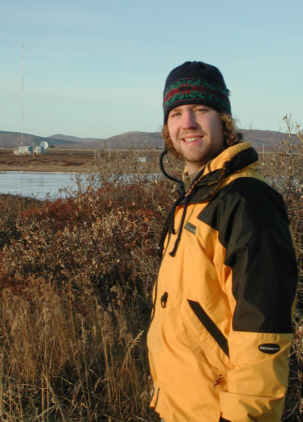 Hemmer is pastor for the small village, which is located on the Yukon River about 200 miles east of Nome. Kaltag is shielded by hills on three sides. With an ordinary radio, you can hear nothing across the bands. Over the past year, Fr. Hemmer has built a long receiving antenna which can pick up KNOM reliably. On October 10th, KNOM manager Tom Busch and chief engineer Les Brown, both radio technicians, flew to Kaltag to determine how to accomplish the project. The FCC has �frozen� all repeater applications, and it may be a long, difficult process receiving a license. October 18th, Tom visited top FCC broadcast engineers in Washington, DC. See below for more information, and for many photos of the Kaltag trip, for which there was no room in the printed "Nome Static.". Perhaps some of us fail to fully live because we fail to fully appreciate from where, and to where we�re going. It�s not vanity to recognize our own place in life and then our fitness for it. Let�s not waste our time envying others, but rather, devote ourselves to the productive use of our own abilities. 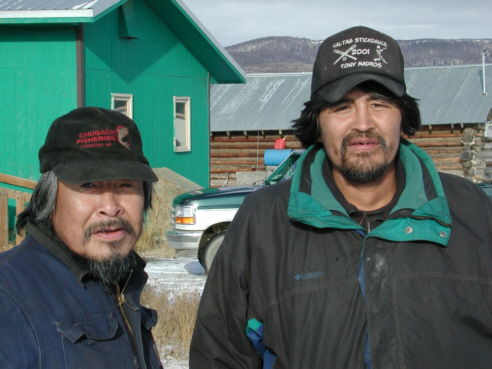 top 230 SOULS inhabit the Athapascan Indian village of Kaltag (left). Historically, it was the site of a cemetery for surrounding settlements. In 1900, food shortages and an outbreak of measles struck down one-third of the region�s population, and the people of three seasonal fish camps regrouped at the site, founding the village. 41.4% of Kaltag�s residents live below the poverty line. Their diet is based upon the land and the Yukon River: salmon, white fish, moose, bear, waterfowl and berries. In this image, snapped while circling above the Yukon River in a little Cessna 207, you can see St. Theresa Catholic Church as the large white building toward the left. (Left) Fr. Hemmer records a Global Positioning System reading for Les Brown. LISTENERS: From left, on Kaltag�s main street, residents Andrew Semaken and Bernard Madros stop to chat. Bernard is one of the few people in Kaltag with a long wire antenna, and listens to KNOM at home. Andrew tunes in KNOM at 22 Mile, a fish camp downriver on the Yukon. With no electric lines, the camp is free of static interference. 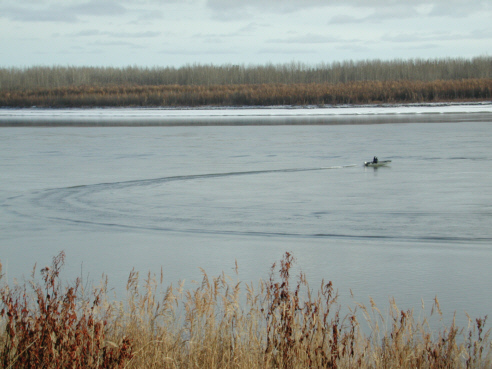 (Left) At Kaltag on October 10th, a pair of "joyriders" slice through paper-thin ice on the Yukon River. 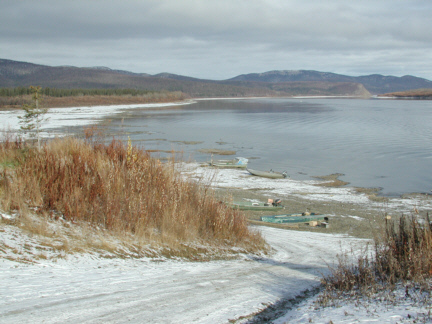 (Left) From Kaltag's northern edge, the Yukon River snakes to the Northeast on its long journey to Canada. 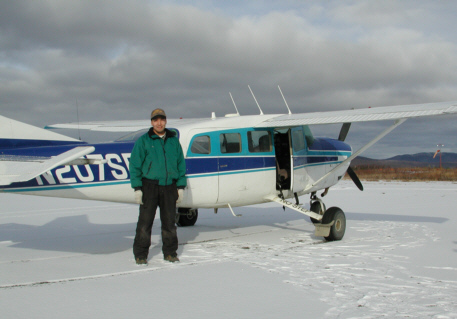 (Left) Pilot Tim Sagoonik (sah-GOO-nik) poses by the Cessna 207 that flew Tom and Les 90 miles to Kaltag from the village of Unalakleet (YOO-nah-lah-kleet). (Left) Those 90 miles are lonely ones, with no sign of human habitation, just mountains, hills, trees and wildlife. top REPEAT THAT AGAIN? As Tom and Les were in Kaltag, �just about everyone� who encountered volunteer Ryan Conarro in the village of Shishmaref (SHISH-mah-ref) asked if KNOM could put in a translator there, too. 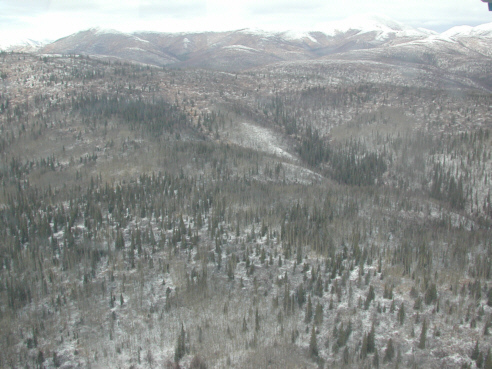 Shishmaref is only 120 miles from Nome, but like Kaltag, it�s shielded by hills. Shishmaref is on a barrier island and has suffered serious beach erosion recently, losing fifty feet of land in one October 2001 storm. The people of the village desperately want the kind of weather information which KNOM routinely broadcasts. FCC NEWS: October 18th, Tom Busch met top FCC engineers in Washington, DC to discuss repeaters for Kaltag and Shishmaref, as well as KNOM�s hopes for increasing night-time power to 25,000 Watts. For Shishmaref, the news is good. Installing a KNOM repeater there is a matter of �life and property,� for which the FCC will waive their freeze of repeater applications. For Kaltag, the news is not so good. Although Kaltag currently receives no radio service whatever, the Commission is not inclined to lift the freeze for procedural reasons. Busch and consulting engineer Jack Mullaney are working on various arguments and angles that may convince them otherwise. Regarding KNOM�s increase of night-time power, doing so would theoretically, though almost certainly not in practice, create a small area of interference to radio station KCHU in Valdez. This area is a thin ribbon, about 5 miles wide, that mostly crosses a mountainous ice field on the eastern side of Alaska�s Kenai Peninsula. 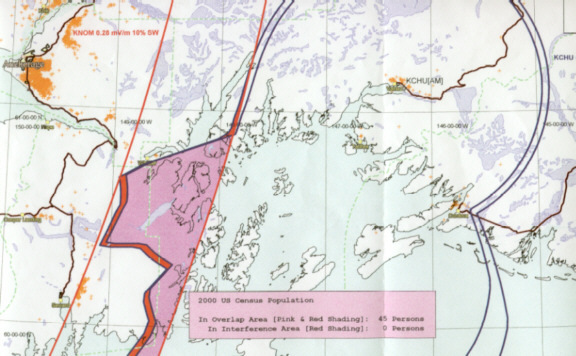 (Left) This theoretical ribbon is the thin red line to the left of this chart by Mullaney Engineering, Inc., approximately 600 miles Southeast of Nome. The tiny theoretical interference zone mostly crosses mountainous ice fields which are completely unpopulated. The circular lines and the jagged ones to the left outline the theoretical coverage area of KCHU. However, in reality, Valdez is surrounded by tall mountains which prevent their signal from traveling more than a few miles. It will be an uphill battle, but we are hoping that the FCC will eventually realize that increasing our night power is truly in the public interest. We will keep you informed. 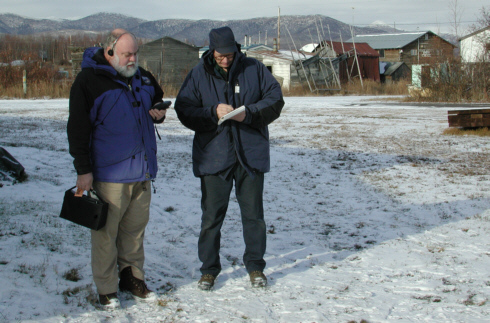 Meet volunteer JOHN HALL (left), across the frozen Nome River mouth from the KNOM transmitter. John�s from McLean, VA, and graduated from the University of Notre Dame this year with a degree in American studies. He serves KNOM as news reporter, covering events and producing hourly newscasts. INSPIRATIONAL SPOT: How do I love God? How do I prove my love for God? By how much love I am giving to the work God entrusts to me. top ANGEL! (left) From left, Tom Busch and Ric Schmidt visit with singer Vikki Carr, who holds KNOM�s ninth Gabriel Radio Station of the Year Award statuette. Carr was co-host for the awards ceremony in San Antonio. As the ceremony closed, she sang an impromptu �God Bless America,� which brought the audience to its feet. Art Linkletter was given the Lifetime Achievement Award, and the Television Station of the Year was WCVB-TV in Boston. Once more, we are in heady company! AND MORE AWARDS: In late September, the Alaska Broadcasters Association gave KNOM its highest honor, the Community Service Award. Best Web Page for www.knom.org. We share these honors with you. Thank you for making our work possible! IT WORKED! Reports are filtering in that in some remote points, our summer�s antenna rebuilding made a tremendous improvement in our signal. Thank you to all! 28,750: That�s approximately how many Inspirational Spots have aired on KNOM since January 1st, plus an equal number of educational ones. Thank you for making KNOM�s signal strong throughout western Alaska 24 hours a day. We remain deeply grateful to you, for you are our strength. We keep you in our personal prayers, and pray for you during our weekly staff meetings, too. May God greatly bless you. May He keep you and everyone you love strong, well, safe and close to Him. INSPIRATIONAL SPOT: Holy Spirit of God, help me follow you. Enlighten me, strengthen me, direct me. Guide my hands, that they may do only good, my speech that it may only help. Dwell in my heart, that it may love only what is right. Wherever You lead me, I will go, whatever you forbid me, I will reject. Whatever you command me, in your strength I will do. Lead me, then, to the fullness of Your truth. Amen.